After I posted about recap mason jar lids for narrow mouth jars, blog friend dearmary offered to order me a cuppow coffee lid for wide mouth jars as part of an order she was planning. We met on Thursday, and talked for an hour. 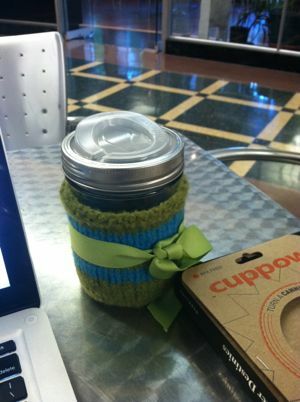 (And she not only brought me the cuppow; she also brought me a jar and a sweet, stripey handknit mason jar cozy!) 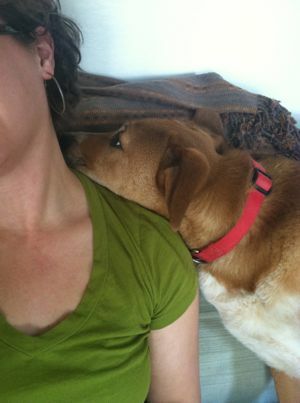 All of this affirmed what I already knew to be true: blog friends are the best. Also, the cuppow has my highest recommendation. I filled it with a latte right away, and when I was done, I flipped the lid inside out and put the regular mason jar lid disc over it, sealing in any remaining coffee drips and making it possible to toss the whole thing in my bag. I am going to use this ALL THE TIME. 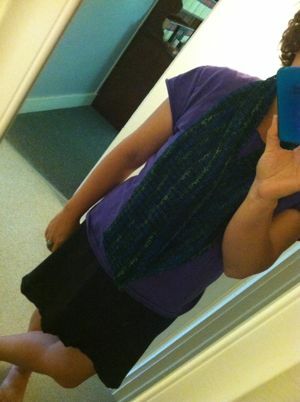 I finished blocking my lilac wine cowl and snapped a few FO pictures. 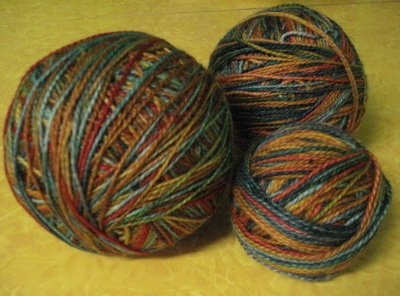 I ended up using between 2/3 and 3/4 of my skein of Fleece Artist Merino 2/6 sock yarn. I could have kept going; I intended to, even, but I developed some sort of lilac wine fatigue last week and was ready to bind off. I think I’ll get a lot of use out of this — in overly air-conditioned lecture halls and during in-between seasons, especially. 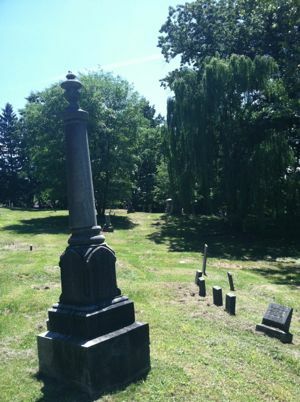 I took a few photos of the cemetery on my walk down the hill from campus. 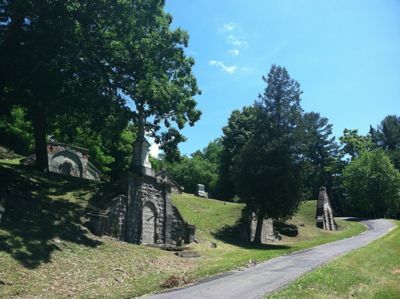 I’m captivated by the house-style mausoleums built into the hillside. 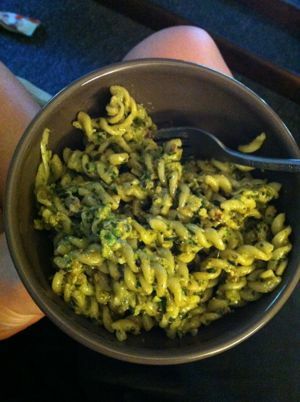 More pesto, this time with garlic scapes and farm basil. 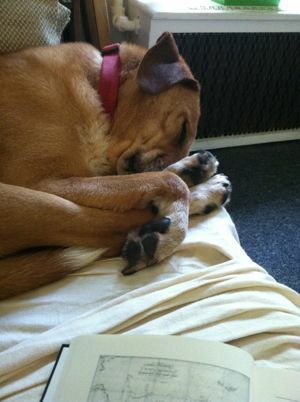 And then there’s Boh and his pile of paws. I’ll post photos of the weekend adventures that prompted such deep sleep soon. I took yesterday off. Like, completely off. And I’m pretty sure it was the first day in a REALLY long time that I did that. (I’m pretty sure I even did a little bit of work every day that I was out of town for my best friend’s wedding.) Back to yesterday. What did I do? Well, I was lazy. And so was Boh. All morning. And then I went to pick spinach at my summer/winter farm’s open house. 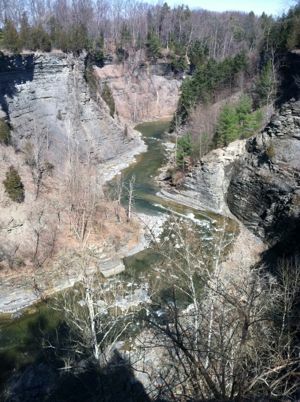 And on the way home, Boh and I spontaneously stopped for a quick walk along the rim of a nearby gorge. So beautiful. And Boh was so excited. Then, I cast on a new knitting project with yarn recently released from a WIP, and learned a new-to-me cast on — the tubular cast on. 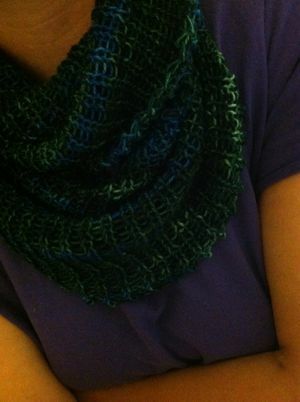 By the time I cast on all 180 stitches of Lilac Wine, a simple cowl in 1×1 rib, I had gotten the hang of it. 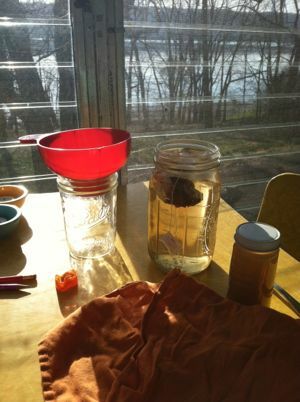 And then I made a quart of cold-brew tea and took the tea and my knitting out to the porch. 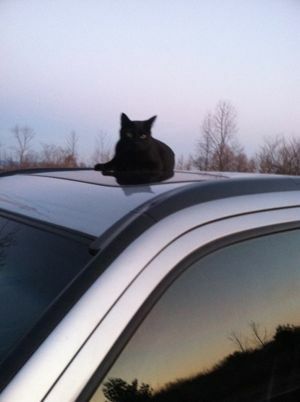 In fact, the second I turned off the car, this cat was on the hood, and it was a bit of a challenge to get myself out of the car without the cat coming in. (This cat belongs to a neighbor.) It then proceeded to settle itself right on top of the sunroof, so I snapped this picture. Boh and I hope you’re having a great weekend. We have plans for a sunset walk and a drink on the dock with a friend. I’m doing some work today, but aiming for the kind of balance that actually makes it feel like the first weekend of spring break. Exhibit A: 1 gallon pickling crock, acquired on ebay. Exhibit B: Kraut-in-progress. 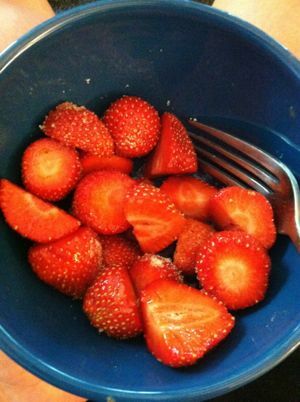 (Note: this is not an exercise in instant gratification. While sauerkraut requires regular checking, skimming, etc., it takes several weeks to be ready to enjoy.) This is my first attempt at kraut, and I am so excited. I always LOVE kraut made by friends (including those pictured further on down the post), and can’t wait to have my very own supply. To celebrate being home, Boh and I met up with friends (of the animal and human variety) for a lovely hike through a local state park. Finally time for a knitting update, don’t you think? Mara continues to be blob-like. 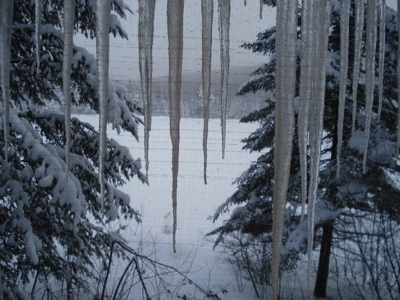 I’m into the second skein of beaverslide, and I’m going to keep increasing until I’m at the recommended width of 46″. I’m at about 40″ now. 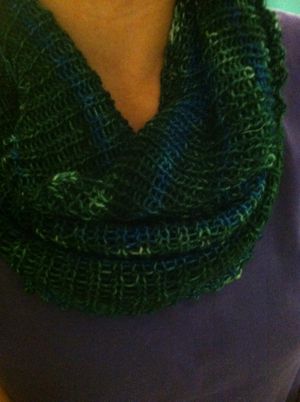 I’m okay with a shorter ruffle than the pattern calls for, so long as the wrap is a good size. This is turning out to be great TV knitting, if only I could keep my hands moving during on-screen suspense! I also managed to sit down at my wheel this weekend, and it felt good to get reacquainted with my current spinning project: Spunky Club corriedale/nylon blend in Soul Windows. 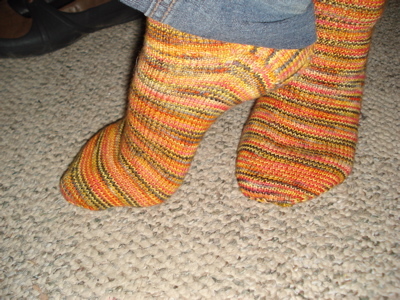 I finished the first bobbin of what I hope will be a 3-ply sock yarn. I know the yarn is way out of focus in this picture, but I really like the way this shot turned out — my lazy kate is on top of a pile of cookbooks on top of a bookshelf. This lovely Fleece Artist Merino 2/6 sock yarn is soon to become Laura Chau’s Milkweed Shawl. The backwards loop group over on Ravelry is hosting a KAL that began on July 15, and once I make more progress on my on-hold socks, I intend to cast on and tackle my lace anxiety! Here, I present my only yarn purchase of the trip — 8 balls of Queensland Cotolino, on sale at my old LYS. These are destined to become Buttercup — the modified version with slightly longer sleeves and a slimmer shape, I think. It feels good to be blogging in “real time” again. Happy Monday, all! I finished my Sunday Market Shawl tonight. It is way past my bedtime, but it was such a slow, unproductive day of writing that I just needed to make progress on something, you know? 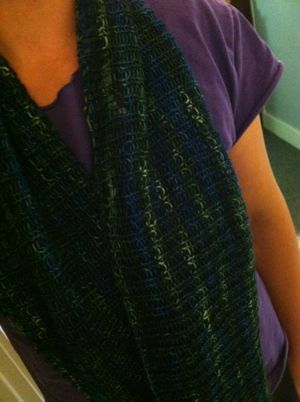 Ends aren’t woven in, and it could use a good blocking, but here it is. I love how vibrant this is! Originally, I thought I’d make this huge, with 2 skeins of Fleece Artist Somoko (or a yarn named something close to that) in the Masala colorway, but this is exactly one skein, and it is plenty large! Also, I have been seriously internet-stalking spinning wheels. I imagine I’ll take the plunge this summer. It is now wayyyy past my bedtime, and tomorrow I am planning a VERY productive writing day. Good night! No new knitting progress to share, but I did manage to wind all of this yarn over the weekend — no small feat, given the number of tangles I encountered. Luckily, the colors are so deep and vibrant that it was worth it. Yarn is Fleece Artist Somoku, in colorway Masala. I ordered this (from yarn4socks, great service!) with the intention of using it to make myself a Sunday Market Shawl that would be a bit wider and longer, more airy shawl than scarf — something to cram into my bag for class, where the temperature seems to range from stuffy and overheated to incredibly over-airconditioned. Other patterns I should consider? Victory! I cast on for these, my second ever pair of socks, in July. Frustrated with how often I was dropping stitches when I tried to watch movies AND work on them, these ball band pattern simple merino socks (so named by me because this yarn is in the Tiger colorway) traveled everywhere with me for weeks without a single row of progress. I picked these up again right about the time I began blogging, and became determined to complete them. In fact, this was the project in my (cavernous) bag the day I serendipitously came upon a group of friendly-looking women knitting at a coffee shop near my house. 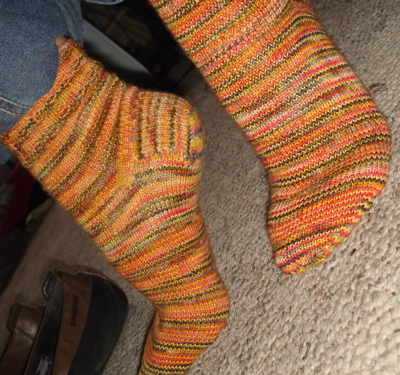 These socks made it possible for me to join them that evening, and I have been knitting with them on Tuesdays ever since. I am very happy with the way these turned out. The second sock is better than the first, and I like that I can see the progress I’ve made. 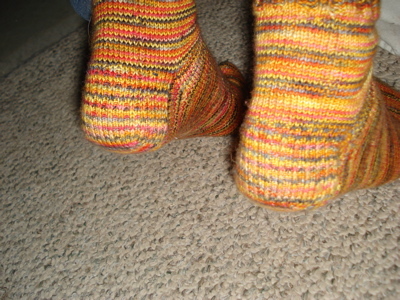 With the pair of socks in my hands, the kitchener stitch at the toes looks a bit messy, but on my feet, it looks much better. I’m excited to choose my next sock project — hopefully using the Magic Loop method. 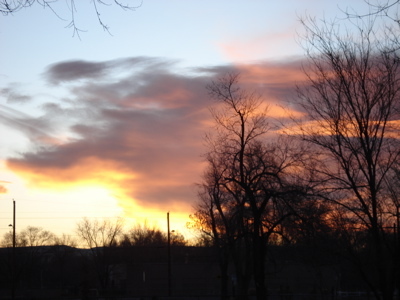 I’ll leave you with a shot of this morning’s sunrise. Have a great weekend! After spending Christmas with my family, Boh and I jumped back into my trusty Honda and headed even further east to meet up with our dearest friend (Boh did some serious bonding on this trip). 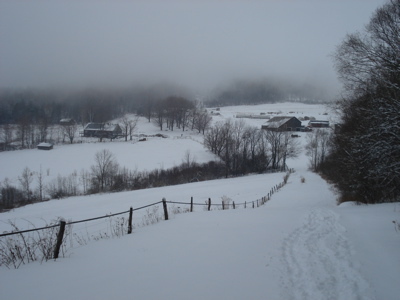 We spent a day gathering our provisions, finishing some top-secret work (thanks, Mad) and movie watching before heading up to Southern Vermont to the Merck Forest and Farmland Center, an educational organization that runs a sustainable farm and has several cabins for rent, year-round, on its 31oo acres. The theme of this trip for us was “luxury camping”, so we hefted our packs, filled with sausage, knitting, reading, down booties, part of a growler of Southwestern beer, brownies, etc. and began the gorgeous hike in to our cabin, a few miles from the main visitor’s center. (Note: the above picture is from the hike out. You’ll notice there is a good 9 inches of snow on the ground. This was not there when we arrived, so we left the snowshoes in the car.) 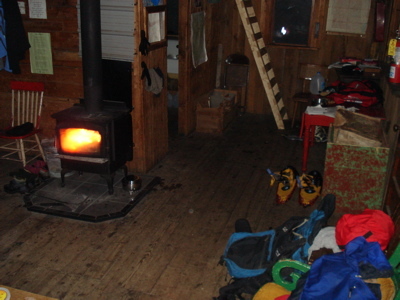 An hour or so later, we arrived at our cabin, stocked with firewood and complete with two wood stoves. 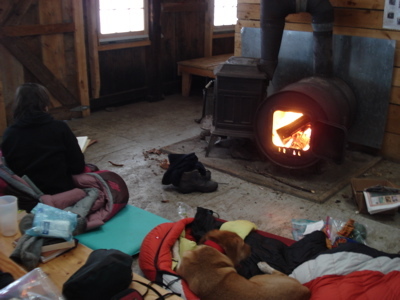 Soon the fires were roaring, and we were settled in for the evening. 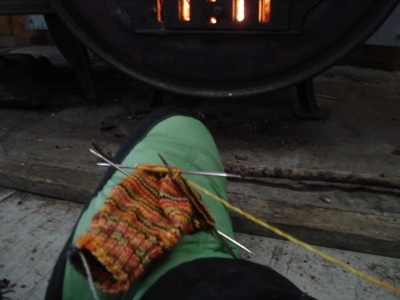 Santa brought me these deliciously warm down booties, and I was thrilled to have them for this trip. It snowed through the night, and on into the morning. It was still snowing when we packed up and began the hike out — a bit more challenging due to the many inches of powder we’d received over the last 12 hours. 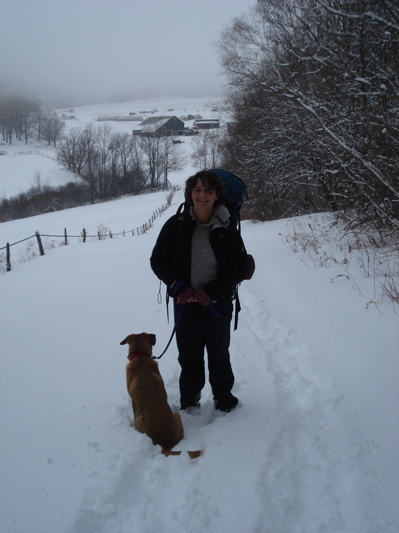 Here’s a shot of me and the dog at that same vista overlooking the farm portion of the land trust. From there, a review of the forecast for continuous snow modified our plans a bit — worried that we might get snowed in at Merck and never make it up to our final destination in northern Vermont, we left early in order to cover some of the mileage before the roads froze and spent a more “civilized” New Year’s Eve making pasta and lounging in a hotel room halfway “up” I-91. The following morning we left early, and it began to snow. We reached the Wheeler Pond Camps just as the previous evening’s guests were leaving. Still snowing. 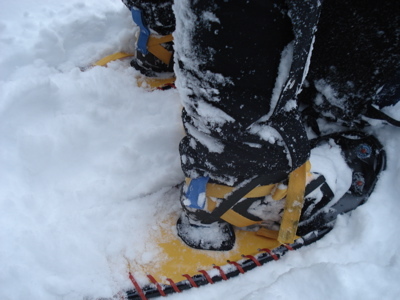 Plenty of snow for snowshoes. 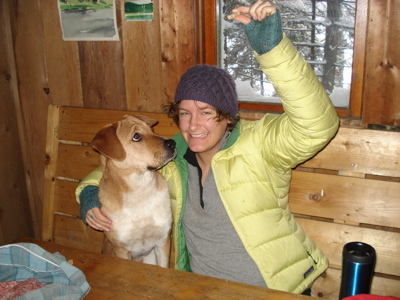 We packed our daypacks and snowshoed out the cabin door, eventually deciding to climb Moose Mountain in the Willoughby State Forest. With Boh leading, we climbed up and up and up, eventually reaching a rather anticlimactic summit that had to be the top! (We confirmed this on the cabin’s map upon return.) 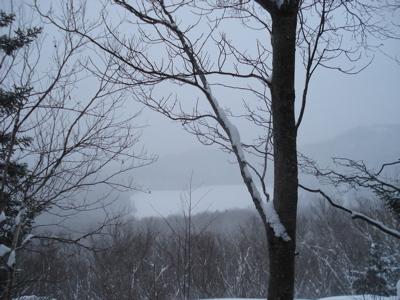 Here’s a view of the frozen pond, from part of the way up Moose Mountain. Feeling invigorated (and okay, a bit sore! 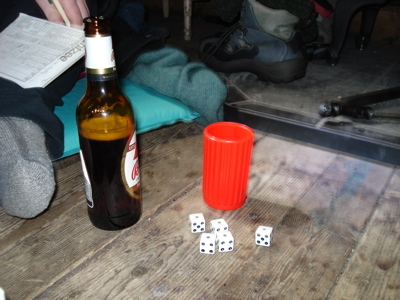 ), we returned to luxury camping, which involved soup, yahtzee, more knitting and reading, a crackling fire and a bunch more snow. I can’t think of a better way to spend the first day of 2008. I haven’t been this relaxed in months, and the company and the setting made this one of the best camping trips I’ve taken in recent memory. The next morning (still snowing), we dug the car out and drove south for one more evening of lounging before I set out for my parents’ house and Maddy went back to work. The next day, Boh and I began the 1801 miles back to our casita — and here we are. 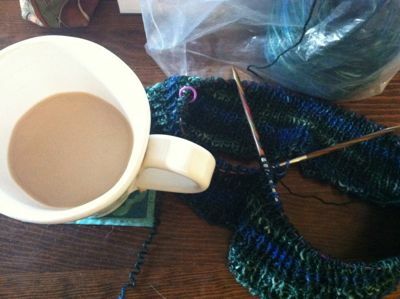 Now that I’ve told you about New Years, I’ll have to sit down and make my resolution list — knitting and otherwise. Stay tuned!